A large winter storm is moving through the Southern Plains, tracking through Missouri and eventually over far Eastern Wisconsin later today. This track means a significant snow event for all of our area, with the brunt of the storm mow through late afternoon today. Snow is now widespread and occasionally heavy across the region with reduced visibility. Allow for extra time getting around and expect delays with many roads being snow covered at times. A winter storm warning is in effect for the majority of our area until much later tonight. TIMING: The first of the snow began around 8:30 this morning and will continue through the afternoon and evening. The winter weather should begin to tape off around 7 PM, possibly ending around 10 PM. AMOUNTS: Once finished this storm will have had a major impact on the area adding several inches of snow accumulation to the area on top of the snow from Tuesday's event. The snow will occasionally be heavy, but snowfall rates should generally remain around 1"/ hr or less. Currently we are forecasting the majority of Western Wisconsin to pick up a total of 5-8" with the lowest amounts to the west and northwest of Eau Claire, while further east, a swath of 7-10" is expected, covering much of Clark County, up through Wausau and to the north. IMPACT: Road conditions have quickly deteriorate now that heavy snow bands have arrived. Roads are becoming snow covered and slippery while visibility is occasionally dropping down to a quarter mile. The snow may be less intense for this evening's commute, but the amount of snow on the ground may make for difficult travel. Northeast and north winds of 10-15 mph will also lead to blowing and drifting, creating additional hazards. 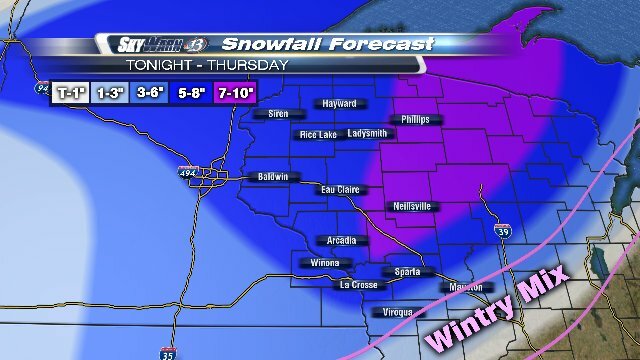 You can get the latest weather updates on WEAU 13 News, weau.com and on various social media platforms. Follow us on social media.